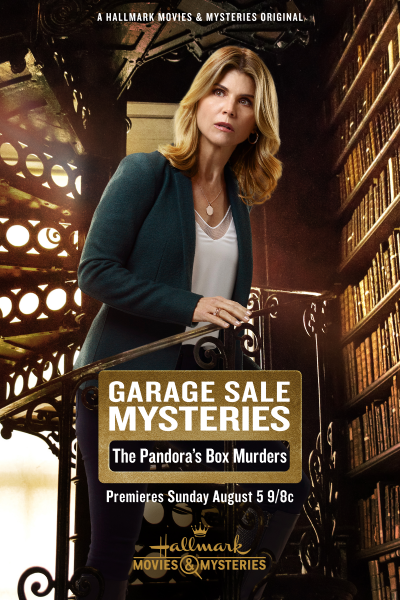 It’s been a year full of surprises, and I know which one I’m most excited about – the return of the Garage Sale Mysteries. Well, the non-thinking part of my brain is pleased at least to see antique seller Jennifer Shannon (Lori Loughlin) back in action after Hallmark teased the series finale a year ago. The Pandora’s Box Murders is a slow slide back into the order of things, and while it isn’t the most gripping mystery, it sates the appetite. The movie gets off to a promising start when we witness an elderly woman frantically jiggle with a puzzle box just before she meets her end. The next day, her daughter-in-law takes the box to Jennifer’s store so that she can try to open it before the family decides to sell it. However, the woman, Tamara (Jessie Fraser), is also found dead in the same house under similar circumstances soon after. Jennifer wonders if the box is cursed or if it’s a simple matter of foul play. Of course it’s foul play, but before she can interfere in her friend, Detective Lynwood’s (Kevin O’Grady), investigation, she has to get a handle on the television production that’s taken over her business. Jennifer’s agreed to allow an Antiques Roadshow type of program to film an episode in her shop, Rags to Riches, and they’ve not only invaded her floor space but have also decided to highlight the puzzle box. As Jennifer juggles memorizing her lines and solving the murder mystery, she suspects that the two might be related. Joel (Lochlyn Munroe), the show’s producer, has ties to the Andronicus family, the influential real estate development company that was headed by both of the deceased, but the wealthy family wasn’t short on enemies on the outside or inside. Protestors object to their aggressive development schemes while a rivalry between brothers Lucas (Lane Edwards) and Quin (Antonio Cupo) threaten the business and Thanksgiving dinner. Despite the intrigue of a puzzle box, some shady relationships, and hottie Antonio Cupo, the movie isn’t a great return to form. It’s serviceable but never takes full advantage of its main artifact – the puzzle box. The Da Vinci Code turned a cipher into a heart-pounding albeit outlandish chase, and though no one expects to see Jennifer zipping through Rome in pursuit of the Illuminati, the story could have done more to heighten the mystery and excitement of the box. The wooden contraption gets a thin few minutes in the starring role, when all the other parts had been exhausted. That those brief scenes turn out to be the most exciting ones, however, attests to how unremarkable the other characters are. The people in Jennifer’s personal life don’t do much to liven things either. Her daughter, Hannah (Eva Bourne) is hooking up with Officer Totally Handsome (Cory Rempel), but their nascent, chaste romance is the only other storyline with half a heartbeat. Highlight for spoilers: Tamara is responsible for spiking mom-in-law’s food with peanut oil, causing her to go into anaphylactic shock and take a tumble down the stairs. She does this after MIL spies Tamara having an affair with the company’s lawyer, Allan Demetry (Kirby Morrow), and guesses this means she’ll be kicked out of the family business and fortune. Quin, who suspected the affair all along tries to warn his brother but the two have serious issues, like Lucas has a restraining order on Quin kind of issues. Dad finds out though and accidentally pushes Tamara down the stairs during an argument. Not wanting her death to expose the family’s dirty laundry, he dusts her with morphine from his recent hip surgery to make it seem like Tamara died from a drug overdose. Cold, Daddy Andronicus.